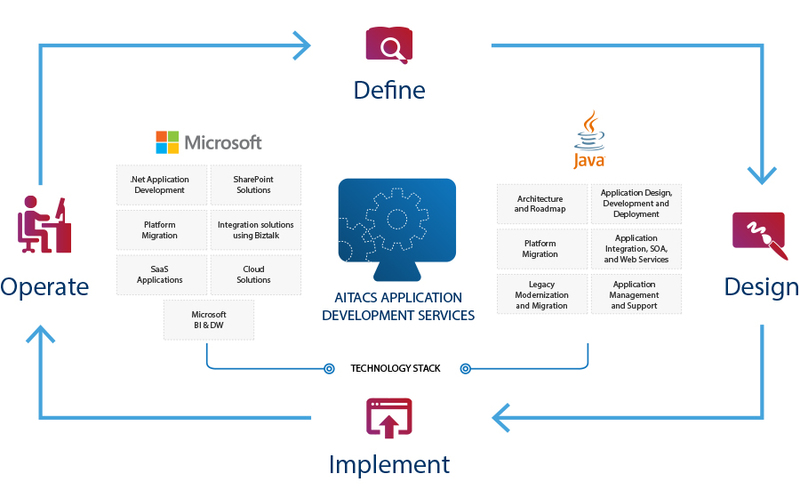 AITACS offers complete end-to-end services in Application development and management that include scoping, design, development, testing, implementation, and support. By leveraging best practices and Agile development methodology, our technical team comprising certified consultants can help you build robust and scalable applications in the most cost-effective manner. We offer services on J2EE and Microsoft technology stack. Through our dedicated Center of Excellence on both J2EE and Microsoft Technologies, we provide the best solutions to our client’s IT Initiatives. The following are the services we offer. Our expertise in Microsoft technologies stack covers solution areas such as Applications and Web development, Portals, Collaboration, Cloud, and Mobility, and utilizes .Net, SharePoint, MS SQL, Silverlight, and MS Azure. Our dedicated pool of resources and project team are engaged in building solutions and offering services in the following areas. AITACS has significant expertise in developing and deploying solutions using J2EE. We utilize our own rapid application development framework that can be used to build, deploy, and implement solutions at a quick turnaround time. Our J2EE services encompass the following service areas.